Rainy summer day in Delft, The Netherlands. I look for cover and I enter into a bookshop -how convenient for a book-addict-. I end up buying a nice Parker pen and an uncommon souvenir: a copy of “Structural geology” by Haakon Fossen. Somehow, it sounds slightly like “The Neverending Story”. Like Bastian, I have been absorbed by a book. It's a long time since I bought my last geologic book in an actual physical shop, and not on a website. It must be special. Haakon Fossen is Professor of Structural Geology at the University of Bergen. Apart from his academic background, Haakon has also worked in the oil and gas industry. You can learn more about him and his interests on his website. The book, published by Cambridge University Press, is an excellent manual on the principles of structural geology. But before commenting on the text itself, I'd like to remark that the material quality of the book is superb. This book simply says “read me, read me more”. Published in an A4 (kind of) size hardback format and full colour glossy pages. Rich in illustrations, sharp photographies and analogues. Divided in twenty-one chapters, the text covers a wide range of topics organised in a sequence that travels from the realm of the small and the infinitesimal to the tectonic regimes that shape our planet. After an introduction to the basics of structural geology, Haakon immediately continues with topics on strain and stress, brittle and ductile deformation and regional regimes (i.e. contraction, extension, transpression and transtension and salt tectonics) and relevant techniques in structural analysis (i.e. cross-section balancing and restoration). 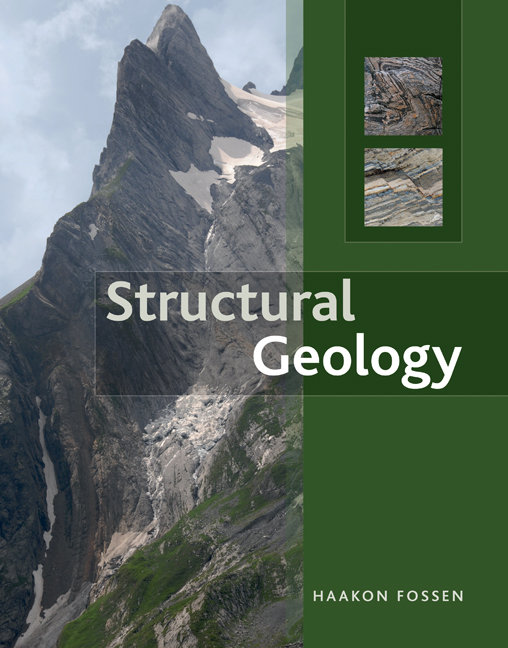 The last chapter provides an integral view of structural geology, as a summary. Each chapter is thoroughly illustrated, from an opening full-page image to the broad variety of tables, illustrations and block diagrams that feed the reader's sight page after page. Most of the examples are taken from up-to-date literature, displaying field photos, seismic features, sand-box and other scaled analogues, etc. ; all very sharp and with very good printing quality. The 3D block figures are nicely drawn and fit perfectly their aim. They portrait the discussed topics clearly and in detail. 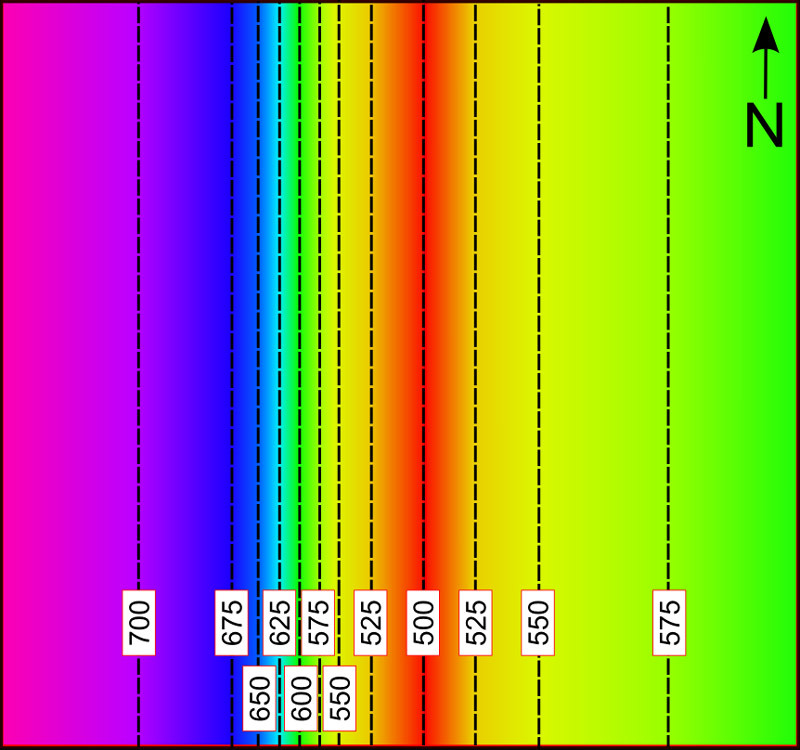 End-member diagrams are also abundant in the text They are clear, complete and not overloaded with too much detail that would mask their purpose. Just for that reason this book is a “must” for any student and professional of the Earth sciences. Haakon's writing is very enjoyable. Easy to follow, fluid and precise. He writes straight to the point, with accuracy and efficiency. The text is easy to follow, as it is very careful in providing good and rich definition and continuous examples. I personally like very much the constant use of mathematical expressions supporting the definitions. A very basic knowledge of linear and matrix algebra will suffice. In depth explanations and short case studies are left for very handy and visually attractive boxes. Each chapter closes with a summary, review questions and a recommendation on further reading. The book closes with two appendixes (one on the deformation matrix, very enjoyable -really!-, and another on stereographic projection) a very useful glossary, the description of the cover pictures of each chapter and the index. Is that all? No. Because the book, actually, extends out of itself. At the end of each chapter the reader can find a recommendation on a e-module, also authored by Haakon, and freely available online in the companion website at cambridge.org . The reader can also find in there all the images of the book in different resolutions, presentations, excel spreadsheets, sample chapters and so forth. Find out more here. If you have to recommend or buy a book on the principles of structural geology, this is the one. 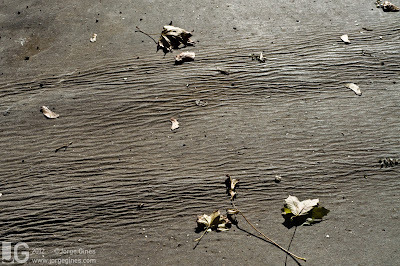 Structural Geology, by Haakon Fossen (2012). Hardback published by Cambridge University Press. 480 pages, 549 colour illus. Dimensions: 276 x 219 mm. The fracking issue in the United Kingdom is being reignited once again since the Chancelor George Osborne has shown in his Autumn Statement support to the the industry in this field, with tax advantages and other iniciatives. I cannot have an opinion on this topic simply because I don't have enough information. But I find annoying how people who become specialists after reading two or three posts in a forum have a ground and solid opinion, not based on facts and data but on opinions of others. How much of the arguments against fracking are pure myths? How much the economy really benefits from this shale production? Surely there are pros and cons, but like in many other topics, "controversy" many times is simple ignorance and fanatism. It reminds me the "controversy on evolution": There is not such controversy, full stop. It's actually difficult to find reliable information on it. Is Blackpool going to collapse? No. Is the Large Hadron Collider kill us all? Well, do you see what I mean with "controversies". A controversy is good, it sparks debate. A "controversy" is not. I doesn't spark anything. Most of sources are biased to one side or to the other, and hardly anyone speaks about the geomechanics behind, about the drilling technique, about the geology involved... The truth is that we consume more and more energy, and we need to get it from somewhere. We all know that oil and gas is a patch and not a permanent solution to our energy needs. But as long as we live in as we do now (heating systems based on gas, cars running on petrol), we need fossil fuels and this is not an option. "They suggest more than 32,000 square miles – or 64 per cent of the countryside – could potentially be exploited for shale gas and is being considered for exploration licences." So what? It doesn't mean that this 64% of countryside will contain profitable prospects. Most of the surface of any country is potentially open for exploration of mineral deposits, and we don't live in open pits, do we? Unfortunately, geology is an unknown topic for the vast population. Hardly anyone stops to think "one moment... this earthquakes in Blackpool, CAN they actually be produced by some fluid injection in the rocks down my feet?" This short clip I found in YouTube is quite appropiate for today. . It's an animation that illustrates part of a talk given by Prof. Mike Stepheson asking, precisely, for information. The public needs information, not ready-made ideas and opinions. And then, they will decide what is best. And yeah, keep wearing shorts and tshirt at home while outside is freezing. That really helps the debate. I find the term "fracking" awesome. I think I will use it as substitute of the F word. "What do you think of this fracking shales thing, pal?" 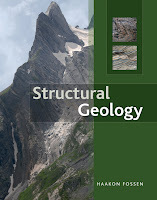 Journal of Structural Geology is one of the publications I like the most in our field. I have full access to it included in my Geological Society membership, and I enjoy taking a look to the abstracts every now and then. I usually try to read a paper from JSG every second week or so. I am not always successful in this! This month catched my attention a beautiful outcrop depicted in the "Photograph of the month" article, provided by Fabrizio Agosta, from the University of Basilicata, Italy, and it display a recent trench dug for a highway in Granada, Spain, where Triassic basement (marbles) are in contact with beach deposits of Tortonian age (Upper Miocene). Those deposits are beautifully deformed during extension in the Betic Cordillera by several normal faults, forming a typical conjugate pattern alternating synthetic and antithetic faults. I find two things very interesting: first, the strain concentration near the marble; second, that the cut is actually double, as there is a smaller slope near the foreground, adding an extra third dimension to the structure. Beautiful! I really would like to include a low quality version of the picture here in this article, but even though the very short article is freely accessible, it would cost me just to embed the photo £18.57. Funny non-open access world! The Geological Society of London revamped their website a couple of months ago or so. It's basically the same site as before, but better organised and with a much nicer layout and design. Thumbs up for this!. One of the things I like the most is the "Online plate tectonics" site, aimed to students aged 14 - 16 (I personally think any person will enjoy it, at any age). The site starts with an interactive introduction to the distribution of plate boundaries, volcanoes and earthquakes. It has also sections on the pioneers of plate tectonics, explanations about the geochemical and geomechanical properties of plates, and how the plate tectonics have shaped the geography of the United Kingdom. It also counts with tests and glossary areas, where the young visitor can check their knowledge and find answers to their questions.The teachers also have their area, with indications and guidelines. A great initiative for kids, teachers and general public alike. 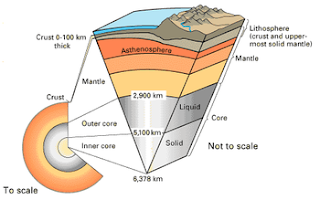 It doesn't matter how much you know about plate tectonics, you will like this site and you will bookmark it! Enjoy it and spread it. Geographic exploration of our the lands of our planet is basically done and we can say confidently that there are not major unknown features out there. People still find waterfalls in the Amazon and the Himalayas -vertical features not easily detected with satellite data- , or relatively small rivers in the jungle -streams covered by jungle- but we have such a good coverage of the Earth by many sensors onboard satellites, that we can hardly imagine a team of explorers discovering a new river or an island. 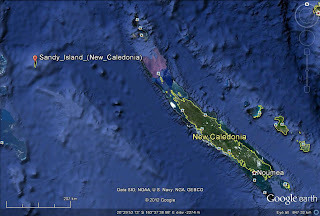 What published yesterday the Guardian is actually quite the opposite: a team of marine scientist in the search of an island that, even though it was mapped in Google Earth as Sandy Island near New Caledonia it didn't really exist. So they undiscovered it! The team on board the RV Southern Surveyor, led by geologist Maria Seton, from Sidney University, embarked on a voyage to research plate tectonics in that part of the Pacific, and passing near the location of the island, decided to investigate it, as they had found discrepancies about its more essential nature: even though Google Earth spotted it, the island didn't appear on the navigation chart of the vessel and no images of it where available. 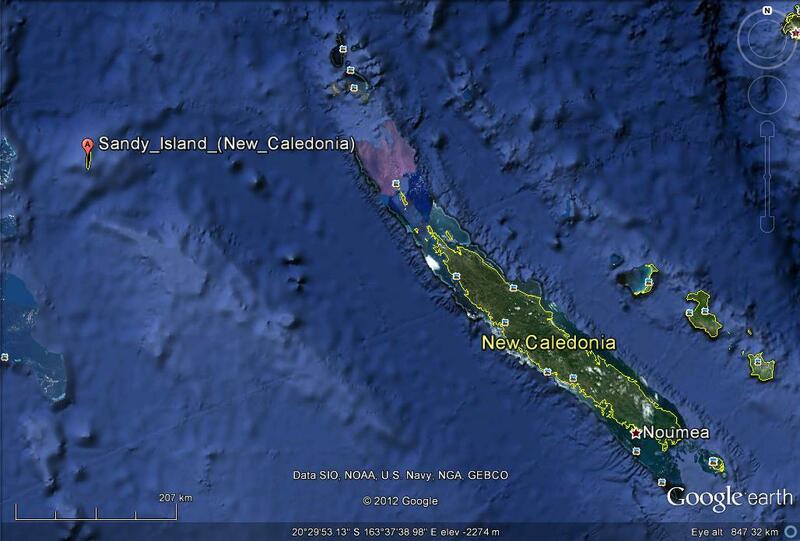 The article in almighty Wikipedia on the Sandy Island reports that some amateur radio enthusiasts had already "undiscovered" the island in 2000, but the story didn't circulate. In that article also explains that it could be a case of a copyright trap -a cartographic method of introducing deliverated errors in order to detect unauthorised copies of a map-. Do you know any similar case of copyright traps? I do them sometimes in my geological maps! By the way, you may not know the story of the Landsat Island, an island not mapped before being observed on Landsat images! I was born at the end of the 70's. One of my earliest TV memories is the Olympic Games of Moscow in 1980. I was 3 and I honestly don't remember much about it. But something I clearly remember from my childhood is watching Cosmos, by Carl Sagan. I don't remember the program itself, because I was probably too young to understand it, but I know I loved it and I loved its music by Vangelis. I remember the excitement in my young minds, probably mixing Cosmos with Galactica or Martian Chronicles! Years later, as a teenager, I spent a fortune (by my standards!) buying the VHS collection. I watched it so many times that after a couple of years the tapes were broken. Today would be Sagan's birthday. He was born on a 9th of November. And today, almost 20 years after he died, people celebrate the "Carl Sagan Day". Sagan was the voice of science, the voice of reason and talked about the Universe in a way that it was impossible not to stop to think what a privileged lot of molecules with conscience we are. Still today, Cosmos has a deep effect on me. It makes me happy to be a scientist and not any other thing. It makes me happy to have spent many nights in the garden looking up to the January sky through my telescope. It also makes me miss people that were around me in the 80's and they are long gone by now. Now you can enjoy it directly in YouTube. Show it to your kids if they speak English! I hope they like it as much as I did 30 years ago. I would like to dedicate this post to my friend Daniel Herrero. He came to my home the day Carl Sagan died, and that was the first thing he told me then. I couldn't believe it, and I later, alone, I cried with the book of Cosmos in my hands. Investigating the History of Climates and life through deep sea drilling. Using fossils in construction projects: London Tunnels to Stonehenge. 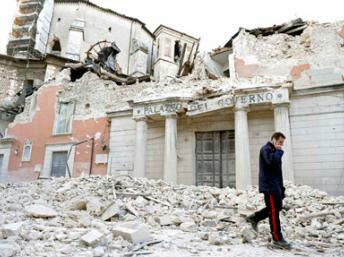 Seismic Faults and Sacred Sanctuaries. Populating Romers’ Gap : rebuilding terrestrial ecosystems after the end-Devonian mass extinction. If that was not enough, there is also an Amateur Photographic Competition on any geological topic, with a £100 1st Prize, a £50 2nd Prize and a £25 3rd Prize. Fancy attending, fancy meeting up? Tell me in twitter or through the comments to this article! For more information, visit the Geologists' Association. 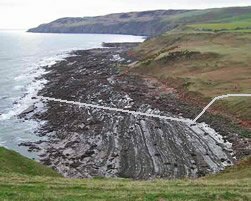 As it have been communicated in the Facebook page of "Save Siccar Point", the planning application for the installation of a waste-water pipeline at Siccar Point has been approved by the local council. If you don't know what is Siccar Point, I know need to say two words: Hutton's Unconformity. Unfortunately, the planning application has been approved by the Council Planning Committee. We called the council last week and were told nothing had been decided and there was no news and that committee meetings are usually at the end of the month. Today we found out the council planning committee met yesterday morning. It all seems a bit suspect and underhand. They have added a few constraints to the application, but nothing that will now stop the pipeline being built and the effluent being pumped out into the sea just 150m from Siccar Point. We can't thank people enough for the time and effort put into objecting to this planning application, but at the end of the day the council have ignored all the excellent objections, said the effluent was none of their concern (it was SEPA's) and have effectively used SNH's approval of the application as the reason why they couldn't object. We're sorry it hasn't turned out differently, but with the application approved there's little that can be done to stop the pipeline being laid. I have been using Twitter for some weeks, and perhaps you would like to follow me. I am progressively focusing on geology issues and general science, but please be aware that I also write in Spanish and sometimes I write about social and current affairs. My tweet feed is not exclusive for this blog, as I don't see the need of keeping a different account for each website I have! Also, I try to keep a flow of 70/100 tweets per week, which I think is a good number. If you decide to follow me, ping me and let me know! Many voices have risen asking for joint letters and statements telling the Italian government about their mistake. "GSA should speak" "GeolSoc raise your voice"!. They are wrong. Communications should be directed to the Italian population, not to their governors/rulers.Italy, like most of countries in Europe, is a democracy where the government and the justice are separated (thanks! ), and primer minister don't have, or shouldn't have, a voice in what a judge decides is best. For that reason, is the people who has to realised that something is very wrong when several scientist are sent to prison for doing their work, which is not looking into a glass ball and predict the future. 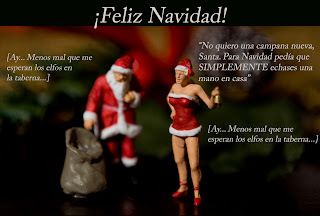 Thanks to my friend José Lires who shared it in Facebook! Perhaps we spend too much time observing structures, and then we extrapolate our observations to every day stuff. 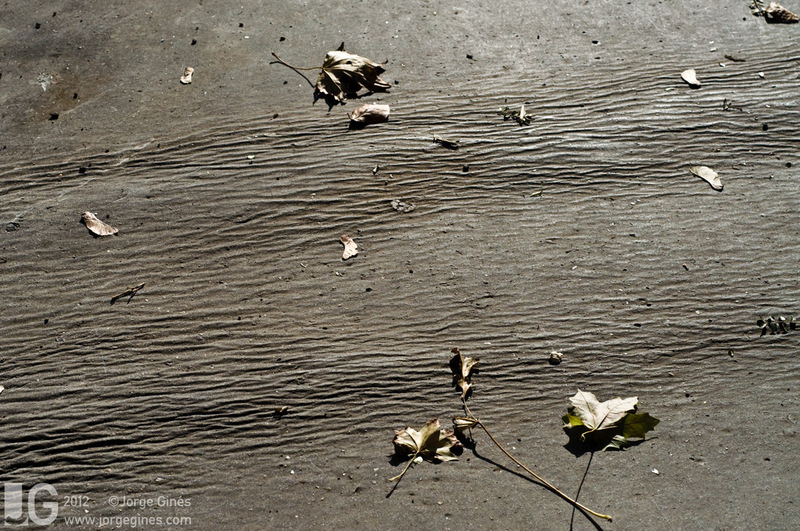 Or simply this is really just a miniature fold belt, made in the asphalt in my street! (...hence the name; "Normanton Road Fold Belt"). I'd happily make a cut in order to study the subsurface structure of this fold belt, but I don't think Croydon Council would like that. What can you see? Can you see some pattern in the little folds? I think I can see that the folds have vergency consistent with the flank where they are, but probably I have to come back to check that out. 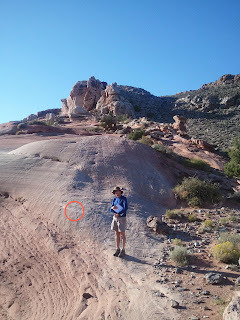 Boudins are competent rock layers that have been stretched into segments, due to layer-parallel extension. Boudinage is the process that forms boudins. 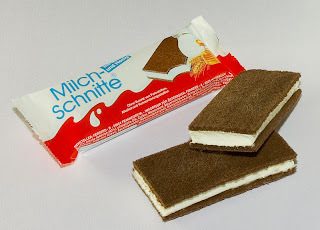 Milch-Schnitte is a type of sweet, popular in Germany, made with two soft spongy cake slices sandwiching a white softer filling made with milk. What is the relationship between a German sweet and boudins? An experiment made by the guys at the Structural Geology, Tectonics and Geodynamics Group at the RWTH Aachen University (www.ged.rwth-aachen.de), where two pieces of Milch Schnitte are compressed vertically to achieve an extension that causes the boudinaging of one of the brown spongy cake slices. But, instead of reading me... just watch the video and enjoy! Remember the story a few weeks ago about The National Trust including the creationist hypothesis as a plausible explanation for the origin of the Giant's Causeway (Northern Ireland) at their new visitor's centre? Let's forget the sectarian nonsense and let's focus in science, the marvel of reason that tries to explain our word through our observations and logical deductions. Today, for Thursday Video, a film produced by the Open University about metamorphic rocks (and also igneours rocks!) 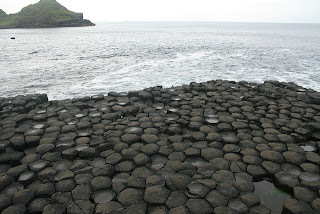 in and around the Giant's Causeway. I have been thinking for a while that this blog could be turned into something -slightly- more personal, and from now on I will write from time to time some posts not directly related with geology. As a geologists who works in an office, in front of two screens, mapping satellite images and doing cross-sections, I listen to a good amount of music. I enjoy very much reading (at home!) and I am also a keen photographer, so why not having some small input from this "other" Jorge? I hope you understand this, and I would like to read your thoughts. Please, leave some comments and let me know what do you think about this decision of including some more personal posts (not much... just from time to time) in this highly specialised and technical blog. Ground control, here I go. 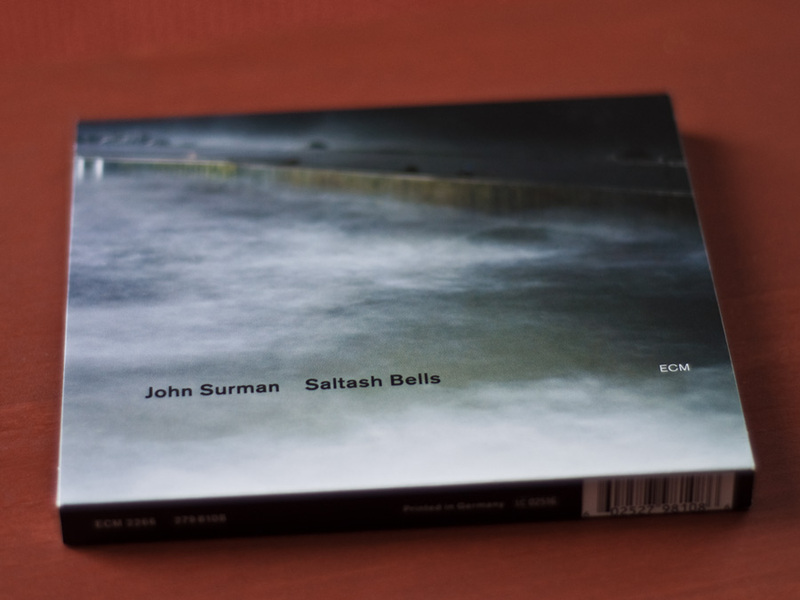 I have been listening for a few weeks to Saltash Bells, a jazz album of John Surman. I have never been a big fan of jazz, fundamently because of my own ignorance of this genre. But this music, together with other European jazz albums -Garbarek, E.S.T., Rypdal, etc.- are filling up to 80 or 90% of the music I have listened to during the last two months or so. John Surman is an English saxophonist. Saltash Bells is his latest solo work, and he plays all the instruments (soprano, tenor and baritone saxophones, alto bas and contrabass clarinets, harmonica and synthesizer) heard in the album. He has a long list of published albums, but this is the first in a long time that he publishes as soloist. 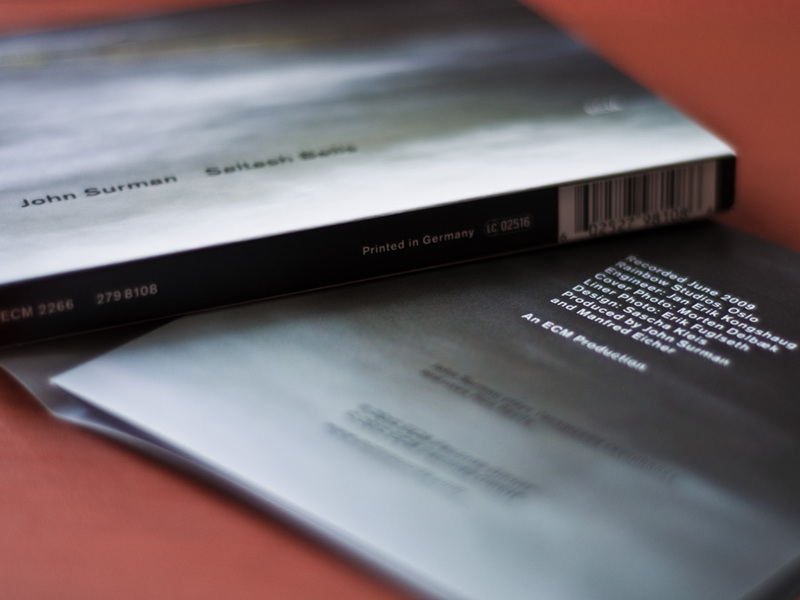 Surman is one of the jewels of the German discographic ECM. 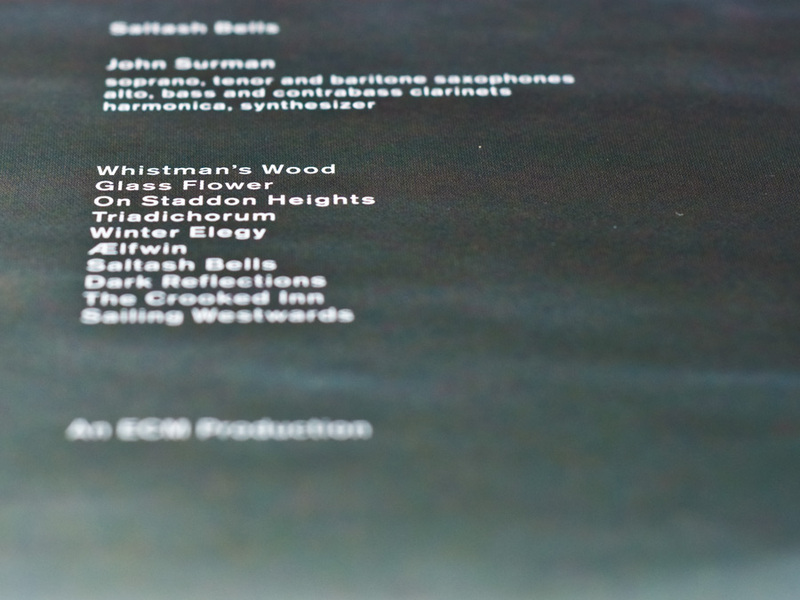 If you don't know ECM, you are missing very good music! This recording has an unmissible English flavour, taking inspiration from folk themes and harmonies that can easily make you imagine you travel through the West Country. In fact, the music was tought as companion for a TV series of documentaries about this part of the United Kingdom, but this project never saw light. The music of Surman is clear, crystalline and very melodic. Background canons and cyclic phrases result in a very atmospheric soundtrack. Whistman's Wood opens the album with a very nice musical electronic texture, which perfectly entangles different instruments blending them in a very beautiful song. It is easy with such music to feel the breeze of the the cliffs of Dorset or the water spray from the beaches of Cornwall. Some compasses even remind me of my home music, from Asturias, in the north of Spain. I hear The Crooked Inn and Sailing Westward and I can feel at home. The Atlantic connection of peoples and cultures is very evident in this music, and I very much like this in European music. A common line in most of the songs is the background sound of bells, which actually give the title to the album -it's the memory as a child of the Sultash Church bells across the waters what he tries to reproduce with a synthesizer-. This music is perfect for working. It is calm, not distracting and so atmospheric that you will listen to it serveral times before you even realise it. At least it let me work on 2DMove! If you want to buy a very good album (and buy it as a CD, with much better quality than mp3! ), just buy Saltash Bells . You can hear to a sample here: ECM Player. Second part of the last "Thursday video". Sorry for the delay; I have been pretty busy with other stuff! 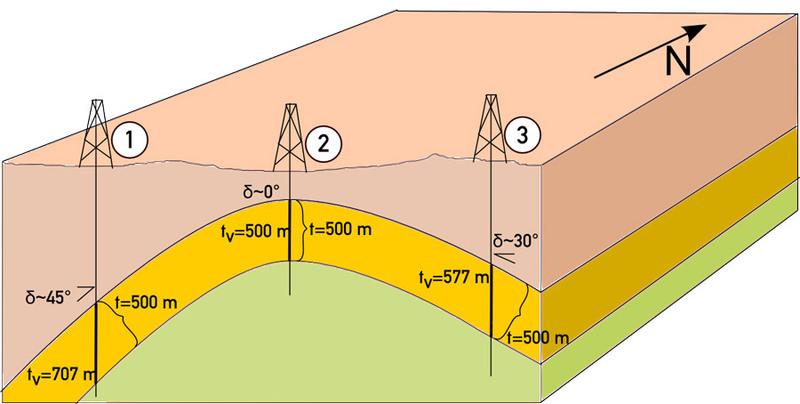 Today's video introduces structural geology (part I). It is presented by Jonathan Bergmann and includes an interview with Dr. Randall Marrett. It is a good introduction to our little corner of the geological room, and it may be useful if you are deciding now what do you want to have as a profession later on. Be aware: structural geology is cool!! If you are studying geology in school, or in college, this video is also useful for introducing the basic concepts of structural geology. If you have any questions... well, just ask, that is why there are comments in this blog! Mechanical and chemical division of Earth. Today's video deals with a topic of tectonics: the difference between crust and lithosphere. Many people mix these two things, and hopefully this video will help you to know when to talk about crust, and when to talk about lithosphere. It is very easy, but many people just don't pay enough atttention! An orocline is an orogenic belt where a change in horizontal direction occurs, characterising the mountain belt by a horizontal curvature or a sharp bend. We can find examples of oroclines in pretty much everywhere. A famous orocline are the Carpathians Mountains, formed by the subduction and continental collision between the European and the Apulian plates during the Alpine orogeny. The Variscan orogen in Iberia also forms a remarkable orocline (but much older than the Carpathians! ), and this video shows its evolution, with emphasis in the different timing of granitic bodies emplacement. Very interesting indeed! This video is the companion of a paper published in Tectonics last year by a series of researchers From the ODRE group (University of Salamanca), Universidad Complutense de Madrid, Natural History Museum of London, University of Victoria and St. Francis Xavier University, both in Canada. Gutiérrez-Alonso, G., J. Fernández-Suárez, T. E. Jeffries, S. T. Johnston, D. Pastor-Galán, J. 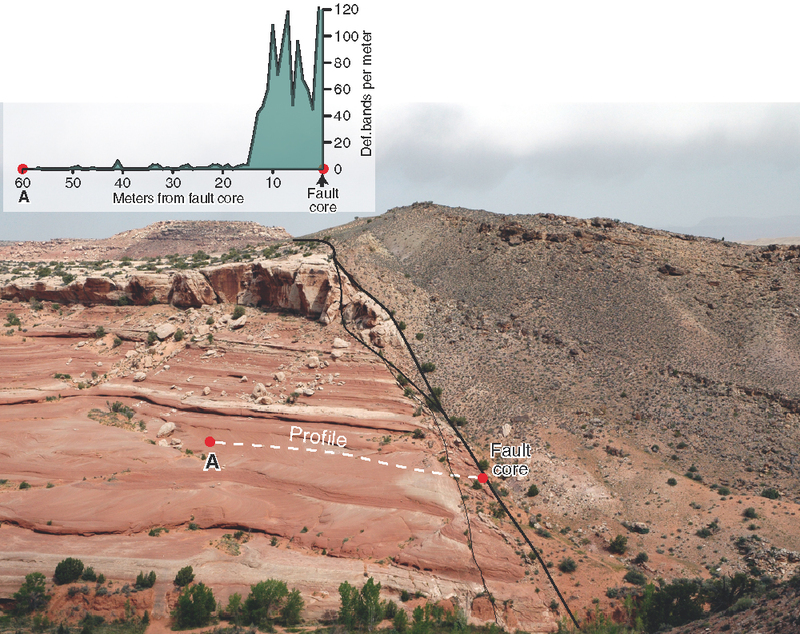 B. Murphy, M. P. Franco, and J. C. Gonzalo (2011), Diachronous post-orogenic magmatism within a developing orocline in Iberia, European Variscides, Tectonics, 30, TC5008, doi:10.1029/2010TC002845. U-Pb (zircon) crystallization ages of 52 late-Variscan granitoid intrusions from NW Iberia (19 from new data, 33 from previous studies) constrain the lithospheric evolution of this realm of the Variscan belt of Western Europe and allow assessment of the relationship between oroclinal development and magmatism in late-Carboniferous-early Permian times. The U-Pb ages, in conjunction with a range of geological observations, are consistent with the following sequence of events: (i) oroclinal bending starts at 310--305 Ma producing lithospheric thinning and asthenospheric upwelling in the outer arc of the orocline accompanied by production of mantle and lower crustal melts; (ii) between 305 and 300 Ma, melting continues under the outer arc of the orocline (Central Iberian Zone of the Iberian Variscan belt) and mid-crustal melting is initiated. Coevally, the lithospheric root beneath the inner arc of the orocline thickened due to progressive arc closure; (iii) between 300 and 292 Ma, foundering of the lithospheric root followed by melting in the lithospheric mantle and the lower crust beneath the inner arc due to upwelling of asthenospheric mantle; (iv) cooling of the lithosphere between 292 and 286 Ma resulting in a drastic attenuation of lower crustal high-temperature melting. By 285 Ma, the thermal engine generated by orocline-driven lithospheric thinning/delamination had cooled down beyond its capability to produce significant amounts of mantle or crustal melts. The model proposed explains the genesis of voluminous amounts of granitoid magmas in post-orogenic conditions and suggests that oroclines and similar post-orogenic granitoids, common constituents of numerous orogenic belts, may be similarly related elsewhere. If you don't have clear what is dip and strike, then take a look to this video. I am planning to post more advanced stuff, but this blog is open to everyone and of course, many different levels of knowledge. BUT... have in mind that this video could be more precise when she talks about anticlines and synclines in the first slide, and about the direction of strike (which... I wrote some months ago about it). In any case, it is a good introduction for students and the general public. Where the mass comes from? 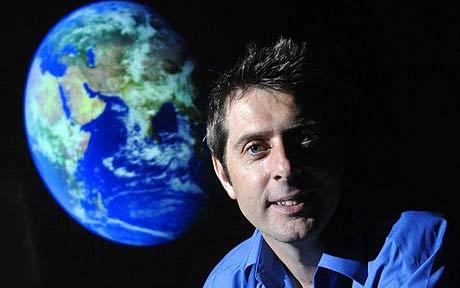 Have you ever heard about the "Expading Earth" hypothesis? Have you ever watched or even listened to the videos posted in YouTube by comic artist Neal Adams? Well, then you may be as amazed as I am by the imagination and persistence of this man. Neil defends the idea, and even calls it "theory" (sorry Neil, but yours is not a theory... check out in some dictionary what is the scientific meaning of theory), that our planet Earth is in constant expansion, and there is a conspirancy and cover up of these "facts". Well... this is funny up to some point. The truth is that this is quite sad, because YouTube is a website that many kids use and it end up spreading this unscientific positions. But, how a 12 year old kid may know that? If you have ever had to answer to some friend why the Earth doesn't grow, if you have ever found a person who thinks that Neil* is right and the rest of the world is wrong... Well, watch this video, produced by "potholer54", an Australian journalist with many interesting videos. Send it to your friends, to the ones who think science is about covering facts! Any student of geology in any university in the world learn during its degree the relationship between the real dip and the infinite apparent dips that a plane contains. Most of students learn how to calculate a real dip from a couple of apparent dips or, inversely, how to work out an apparent dip given the real dip and another direction using the stereonet. 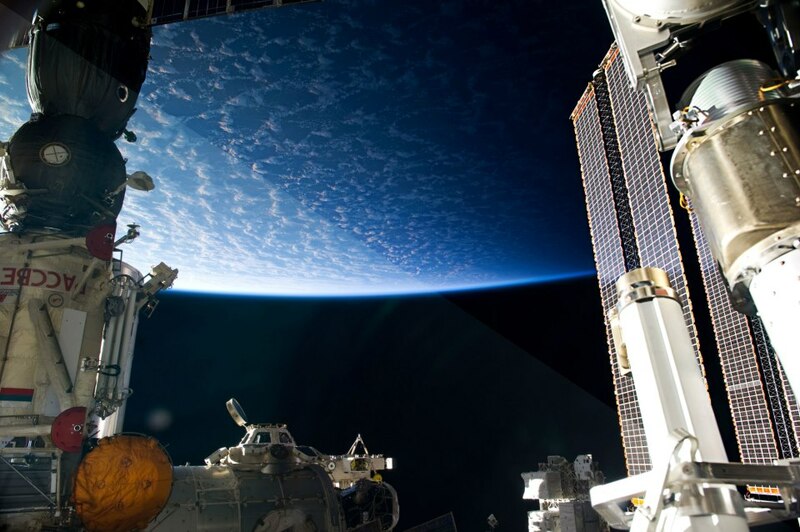 Stereographic projection provides an awesome graphic method for these calculation, which is very useful if one has to do a bunch of calculation, but it is not very useful if we have to deal with a large collection of data, or if we need to have a high degree of precision. Then, it is time for orthographic projections and the always useful trigonometry. δ = real dip. Note that the real dip is always measured along the maximum slope direction for a plane. No apparent dip can be larger than the real dip. α = apparent dip. This is the dip measure along a line which is not the maximum slope direction. β = angle between the strike direction of the plane and the apparent dip direction. Why you would need to use that? Well, for example, I need it sometimes; I work interpreting satellite images, focusing on structural geology. When I measure fracture lengths on a plane, I cannot really measure their length: What I measure is an "apparent length". 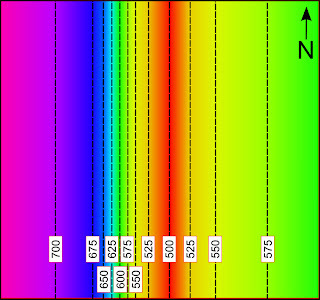 That means, I measure the projection of a line on a horizontal plane. For example, a 100 m fracture on a plane dipping 80 degrees will look very short if the direction of that fracture is the dip direction of the plane, but it will look as 100 m if the fracture is oriented along the strike. Any direction in between, will be variable. If it is variable, how can we correct it? knowing the apparent dip in that direction. Feel free to make any comments, or perhaps any correction of suggestion. Hopefully this has been useful for you. Dr. Bruce Trudgill (assistant professor at Colorado School of Mines) has reported in the Geotectonics email list an act of geo-vandalism in the Bartlett Wash outcrop, in southeast Utah (USA). Many of you may have visited this spectacular location on university or industry field trips, or for your own research purposes. 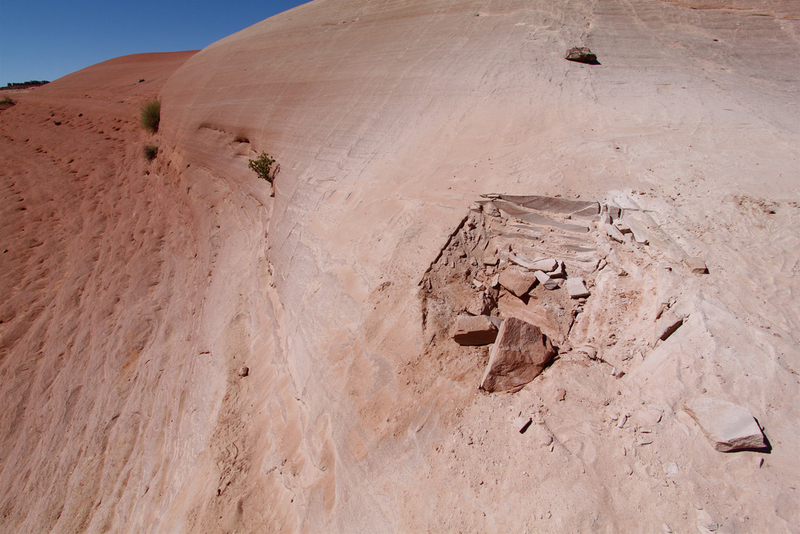 The location of the exposure is on a splay off the main Moab Fault, and it illustrates many aspects of brittle deformation and fluid flow, as well as some un-paralled exposures of aeolian dune sets in the Slickrock member of the Entrada Formation. 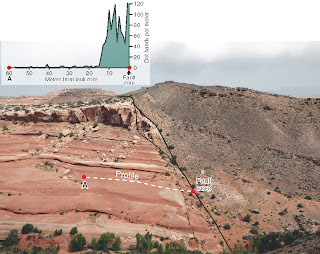 It's a truly world-class field location and has been used in a number of publications and texts, including the following figure in Haakon Fossen's structural geology textbook. Bruce Trudgill in the intact outrop. Red circle shows the area later on vandalised by unknown people. If you know who has done that, you should contact Bruce (http://geology.mines.edu/faculty/btrudgil/) or Becky Doolittle (rdoolitt at blm (d.o.t.) gov) at the Bureau of Land Management. Vandalism is an act of crime. Why people do that? Reasons (excuses?) are not short. Some people do it for an economic interest: Nice primary or secondary structures, fossils, minerals, etc, are aesthetically attractive, and they can be sold for good money. Researchers need to take samples. But things can be done right, or wrong. Cutting off a cube of rock with an electric saw in an outstanding outcrop, in such a visible place, is plainly wrong. If the responsible guys of this act of vandalism are researchers, sooner or later others will know. They will be the ones who spoilt Bartlett Wash. For future researchers, think twice what you do on the field, and think how would you like to find an outcrop if you would be the next person to arrive. You are scientist, full stop. Preservation of nature has to be your main objective, always. Thanks Bruce for raising the voice about this sad issue. Many of us have never been there, or even near, but that doesn't mean we don't feel something has to be done. Thanks also for the pictures and the permission for the quotations! Narrow Angle Camera (NAC) of the LRO spacecraft. It is about 500 m wide, and nearly 20 m deep. Who has not read a thousand times that our Moon is a death body without any activity? Well, it turns to be the opposite: The Moon has been active at least until very recent times, and very likely this activity continues now. Lunar Reconnaissance Orbiter (LRO) spacecraft has obtained images of the surface of our satellite where extensional faults are clearly visible. 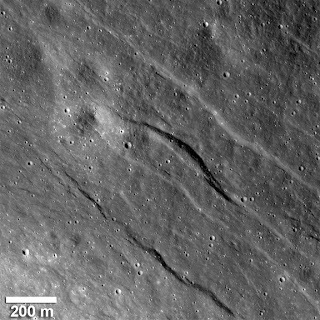 NASA estimates that this faults are not older than 150 million years, which is pretty young for what we expected to be the lunar tectonics. Two years ago, the Lunar Reconnaissance Orbiter mission also detected other young geological features, which where interpretd as compressional uplifts. It was said, at that time, that the Moon is shriking. But the identification of extensional faults shows that this shrinking (due to thermal contractions) is not homogeneus everywhere. The Geological Society of London opened a few months ago a channel in YouTube with the aim of reaching a larger audience through divulgation videos. Yesterday, The Geological Society uploaded a very interesting inteview to Dan McKenzie and Fred Vine, where they discuss the early history of development of the theory of plate tectonics. The clip is taken from 'Dan McKenzie and friends: highlights from the Bullard labs'. [Copyright: 2011 Cambridge University (Depart. of Earth Sciences)]. There are methods in structural geology that if one doesn't use them regularly, soon become rusty and we simply need to refresh them from time to time: how to rotate lines and planes with a stereonet, how to solve a three-point problem, etc. The manual contains explanations and exercises on attitude measurements, true and apparent dips, three-point problems, stereographic projections, rotations with the stereonet, stereograms, geologic mapping and cross-section construction, thickness and outcrop problems ans statistical techniques. It is written in a very approachable style, and completed with good figures that will help anyone to understand and practise the foundations of our profession or studies. I hope you find it useful. Comments are welcomed, as usual! Last winter I created a photobook for my dad. He doesn't have a computer, and I thought it would be nice to show him my pictures together with a (not mine!) poem that reflects my thoughts about each photo. 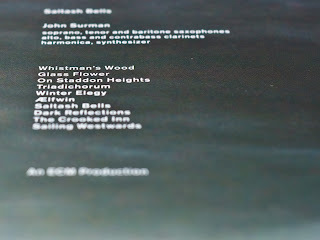 I won the "Best book of March" award, and now I am compiting in the "Best Photobook of the Year 2011" contest. Competition is hard!. b) Vote for me! 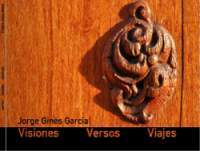 Just click on "Vote for this book" in http://www.bobbooks.co.uk/bookshop/users/JorgeGines/visiones-versos-viajes/ . It couldn't be easier! Bobbooks offers, by the way, an amazing quality, great value for money. Highly recommended, and a great idea for a personal present. Important note: Let me know if you have voted. I will raffle, if I win, a £50 gift voucher from www.bobbooks.com amongst those voting for me! 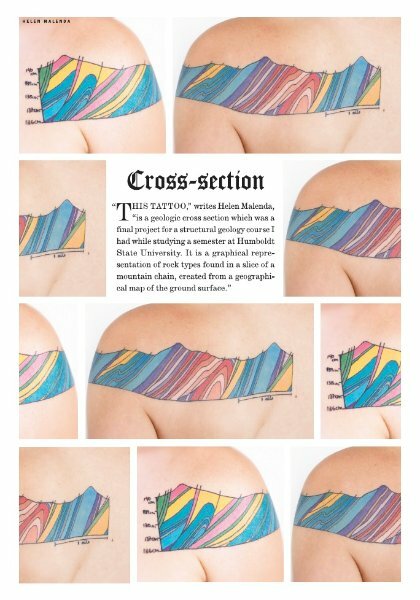 Yesterday, I was looking for an article in the New Scientist website, and I found this another article by chance: "The best science tattoos and the stories behind them"
What is the first thing you see? 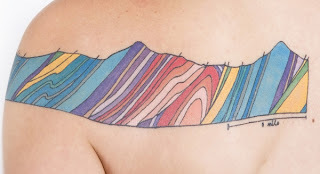 A cross-section tattooed on the shoulder of Helen Malanda, a geology postgraduate student. The tattoo is portraited in the latest book by Carl Zimmer - "Science Ink; Tattoos of the science obsessed". See more about it here and here. Oh, and happy New Year! This is post 100th, by the way!